Welcome to Smokie Ridge Vineyard! ​Introducing our family owned and operated winery in Ottawa's backyard. 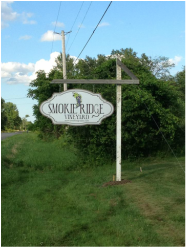 A short drive from Ottawa, Smokie Ridge Vineyard is a local family owned and operated winery specializing in northern varietal grapes. We were established in 2007 and have raised over 10,000 vines from infancy within 40 miles of one of the world's coldest capital cities. These hearty "Cold World" varietals include Frontenac, Sabrevois, Louise Swenson, St. Pepin and Marquette and can be tasted in our 201﻿0 to 2015 vintages, our sm'Oaked Collection and our recently launched Dessert Wine. We are delighted to share that we have recently been mentioned in an article as being one of 5 vineyards worth the drive to visit. We are honored to be among the other vineyards listed in the article and urge you to check them out and see why. The drive isn't bad either.